In the previous two articles, we took a detour in order to explore two interactions between theology and the science of astronomy. In the first, I argued that the oft-repeated narrative, which holds that Copernicus’s heliocentric model demolished a prideful, theologically inspired anthropocentrism, was not historically accurate. In the one that followed, I argued that a historically better-grounded challenge to Christian theology (but not to Judaic or Islamic) came from the direction of extraterrestrial life. Thomas Paine had confronted Christians with a difficult choice, between a redemptive scheme limited only to human beings, or a God who had reincarnated many times over in order to work out the redemption of alien beings as well. In this article, I’d like to return to Arthur O. Lovejoy’s Great Chain of Being. 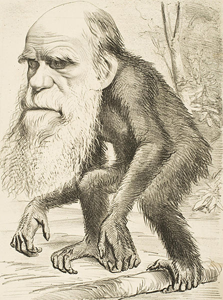 A Venerable Orang-outang (1871), caricature of Darwin originally published in The Hornet. The reason is that the story of Darwinian biology is often told something like this: Once, people believed that every species of living thing was a unique creation, patterned on a design plan. William Paley argued, in his famous thought experiment, that if you encountered a watch on a beach, you would reasonably infer the existence of a watchmaker, even if you couldn’t find him anywhere nearby. Animal life was just like that, according to William Paley. You could see that the animals were designed according to a plan, so you would naturally infer a designer—or, in other words, God. And God’s goodness was evident in the marvelous way that the animals were adapted to their environment. The eye, for instance, is an incredible piece of architecture. It shows that God wanted human beings to be able to see, so he designed the human eye for just this purpose. How could anyone believe that the eye could come about at random? If it did not come about at random, it must have done so as a result of a design. And the only being that could design something as wonderful and intricate as an eye was God. So, Paley argued, biology proved the existence of God. But then Darwin showed that you don’t need a design plan in order to account for species and their adaptations. Natural selection could account for the whole world of life, and all the adaptations of the animals, without any need for a designer. Since there was no need for a designer, there was no need for God. Science, if it doesn’t necessarily disprove the existence of God (though some scientists, such as Richard Dawkins and Victor Stenger, have argued that it does), at any rate renders God unnecessary. Science advances, God retreats, according to this story. Well, the part about Paley and Darwin is true, as far as it goes. But framing things as a contest between Paley’s natural theology and Darwin’s biological science tends to exaggerate the importance of theology to the discussion. As I’ve tried to show in previous discussions of Lovejoy’s book, what science (certainly Darwinian science) has really changed is our conception of knowledge itself. Logically rigorous deductions from definitions, as one finds in geometry, used to count as knowledge about all sorts of topics. Today, the scope for this sort of thing has been greatly restricted. Not many people would think that starting from a definition of “life,” and then making deductions from those definitions, is a valid procedure in biology. But it used to be, and that’s what Darwin really changed. Paley’s “clocks,” i.e., the design plan of the animals in nature, was really another instance of Plato’s other-worldly forms. And, historically, people who have believed in the forms have tended to believe in God as well—for forms are thoughts, and how could thoughts get there without a thinker? And how could they structure the world of sense experience, unless that thinker was also the Creator? So, when people oppose natural theology to science in telling the story about Darwin, the result is to obscure the extent to which both natural and Christian theology were based on the inheritance of prior knowledge. Undermining the Platonic worldview has been a much more momentous shift in our intellectual orientation then undermining the authority of Genesis as a history of creation, although surely both are results of scientific discovery. But Paley’s natural theology is only one instance of a much broader pattern, uncovered by Arthur O. Lovejoy. In a previous article, I described the great chain of being as the other, oft-forgotten, half of Plato’s philosophy. It was the view that God must have created everything that logically could exist, because God, being good, and therefore a stranger to envy, would not begrudge the privilege of existence to anything that could exist. Hence, God creates everything that can exist. So where Plato’s philosophy is often thought of as other-worldly, since it directs us to the contemplation of the invisible and eternal forms (and, by extension, to their Creator), there was also an exuberant, this-worldly element to it. Existence was packed to the brim with literally everything that could exist. A somewhat different, though similar, problem was created by the discovery of fossils. They certainly appeared to be the remains of living things. When we look at a Tyrannosaurus skull, for instance, it seems just obvious that it is… well… a skull, a remnant of a living thing. But there were no such creatures in the eighteenth century, plainly, so how could the fossils be accounted for? The whole concept of extinction was offensive to believers in the great chain of being because it would create a gap in that chain. Recall that the continuity of the chain was one of logical necessity. Logical necessity is not a temporal or a spatial construct—it’s supposed to apply equally, always and everywhere. The law of non-contradiction does not apply on just Tuesdays and Thursdays, it applies every day. It does not apply on earth, but on the moon and in the Virgo Supercluster and every other conceivable place. So logical necessity has nothing to do with time and space, it’s an atemporal, aspatial, totally uniform concept. So, if the existence of all creatures that logically could exist was itself a logical necessity, then species could not come into being and could not go out of being. They could not be created, and they could not become extinct. (At least on the creation part, theologians obviously have tended to disagree with Plato, but Christian theology was a mixture of Greek and Hebrew ideas, and as Hebrew Scriptures plainly involved the idea of creation, Plato could not be authoritative there.) How, then, to account for fossils? The answer was a device with which we are perhaps familiar, albeit in other contexts. If you take any number of minerals, subject them to more or less random forces of distribution, pressurization, erosion, and so on, then at least some of the time you’re bound to get rocks that look like fossils—so the argument went. It’s like looking up at clouds. You think one looks like a camel, another like a house or an airplane, etc., but actually it’s just a pattern that you superimpose on the cloud, it’s not in the cloud itself. Eighteenth-century biologists who were committed to the chain of being idea referred to these fossils as “sports of nature,” or in other words, games of nature. They could be misleading at first glance, but since it was already known that extinctions could not occur, and no such animals seemed to exist, they could not actually be the remains of animals. This approach did not satisfy everyone, however. As it was increasingly realized that the chain of being was inadequate to explain the empirical evidence that naturalists had to explain, another proposal was offered. Some naturalists began to argue that, although not every kind of living being did exist, they all would exist, in time. So the chain of being was reinterpreted as the unfolding of cosmic necessity. The “always and everywhere” character of logical necessity was compromised in order to fit the chain of being idea into the evidence. This had the advantage of allowing naturalists to interpret fossils as what, to all appearances, they really were. And it became more important as more fossils were being discovered. In Paley’s time (roughly 1800), geologists began to realize that fossils were neither evenly nor randomly distributed. Simpler organisms appeared in the lower rocks, more complex in the higher. So this seemed to indicate a progression from lower to higher forms of life. And it was argued that this progression was the unfolding of the logical necessity of the great chain of being. So evolution, before Darwin, was an adaptation of the very Platonic philosophy which, disguised under accounts about William Paley’s natural theology, is often held up as the antagonist of evolution. Now, I don’t want to claim that Darwin himself was only acting out a Platonic idea of nature, because that wouldn’t be true. Darwin represented a radical break with past conceptions of the world of life, but not because he argued for evolution. This is another fact of the history of biology that is sometimes obscured by the Paley vs. Darwin story discussed earlier. Evolution had, in fact, been proposed in the eighteenth century, even by Darwin’s own grandfather, Erasmus. The most famous pre-Darwinian theory was that of Lamarck, who wrote about 50 years before Darwin’s Origin of Species. It was argued for again in an 1844 book by Robert Chalmers, Vestiges of the Natural History of Creation. The official scientific establishment of the first half of the nineteenth century was opposed to evolution, partly for reasons having to do with paleontological evidence, partly because no convincing mechanism for evolution had been proposed, and partly because evolution had acquired associations with political radicalism during the French Revolution. (Erasmus had been sympathetic to the Revolution, Lamarck had been appointed by Napoleon.) So evolution was around, but it was a contested idea, and in the decades immediately prior to Darwin it was not well established. What Darwin changed was that he proposed a mechanism for explaining evolution—natural selection. But even then it would be another 50 years (approximately) before Gregor Mendel discovered the laws of heredity. With Darwin, evolution became firmly established. Darwinian biology is a large part of the reason that Platonic ways of thinking, as exemplified by the chain of being idea, are less attractive in our time. Darwin showed that the world of life was not composed of discrete species, built on an other-worldly design plan. In fact, there are no species—there are only interbreeding populations. The concept of “species” is a useful abstraction. It has nominal utility for describing the world of life, but when you start really getting into the biological science and looking at larger timescales, you see that what looks like static species from the standpoint of our normal experience of time is actually very fluid on the timescales of evolutionary biology. If species were not fixed, there could be no design plan, and hence Paley’s argument to the effect that the adaptation of species to their environment showed the existence and benevolence of their Creator, failed. But if Platonic idealism was false, then that made materialism much more attractive. The philosophy of Democritus and Epicurus, long since considered discredited, was to enjoy a tremendous revival as a consequence of Darwin’s discoveries. Indeed, that revival has continued right up to our own time.